Today Isola is a pleasant and romantic small fishing town in which traditions of fishing and crafts are still alive, this being especially visible during the summer period when the traditional summer fishing festival takes place all over town. The oldest building in Izola is the Church of Mary of Haliaetum, consecrated to protect fisherman and fishery. At the top of the island stands the church of St. Maurus, the town’s patron saint. Legend has it that the townspeople prayed to their patron to save them from the incoming Genoese navy (adversary of the Venetians). A white dove appeared and drew the enemy’s navy away from the town out to open sea where a storm destroyed the attacking ships. Hence, today’s symbol of Izola is the white dove with an olive branch in its beak – a symbol of peace and safety. Izola is a hidden gem between the town of Piran and Koper. Formerly an island; where originates its name from, is now a seaside town, preserving the fisherman’s traditions. Small harbor is the belly of the town, where all the streets meet is its center. You can enjoy pleasant walks around the town and spend some time observing the locals on the seaside promenade. Izola is keen to preserve its past tradition with several events taking place during the summer months. A nice initiative is also the promotion of local, 0km produce that takes place in the center with the local restaurants. You can find the month of the wild asparagus as the main ingredient on the menus or the next month when the highlight are the black mussels. Orange Wine Festival is a celebration to the new sort of the wines. Orange wine has started as a trend, but through the years are gaining all the needed respect. The event takes place on Piazza Manzioli, which is the heart of Izola. Fishermen’s Festival is the festival of the year, celebrating the rich fishing culture and tradition of Izola. The event takes place in August and offers a large musical entertainment and seafood trucks. Kinotok is an international cinema festival that welcomes the directors and movies from abroad to be presented to the public within the city center. The projections are open air during the week in summer. The nearby Sansimon harbor stretches under the so called ‘white rocks’ – Bele Skale, a natural cliff, where you can find a pristine beach with emerald sea. Sansimon is an active and busy beach, where you can simply relax and enjoy all the amenities the resort nearby should offer. Another interesting location is by the lighthouse. At the extreme tip of the island stretches a nice beach with direct access to the sea and a very think shade, under the trees. Hiking routes to the hinterland are a nice option to spend the day walking along orchards and vineyards. You can visit a private winery or enjoy a delicious lunch in one of the many small restaurants. Biking is very popular in the region due to the well-known Parenzana bike trail, that connects the three countries of Italy, Croatia and Slovenia. Tennis is also well represented with many tennis courts in Izola. Day at sea shall be on the list as well, either an organized cruise with a lunch or a private sail with a fisherman that introduces to the regional catch or a wine tasting on the boat. 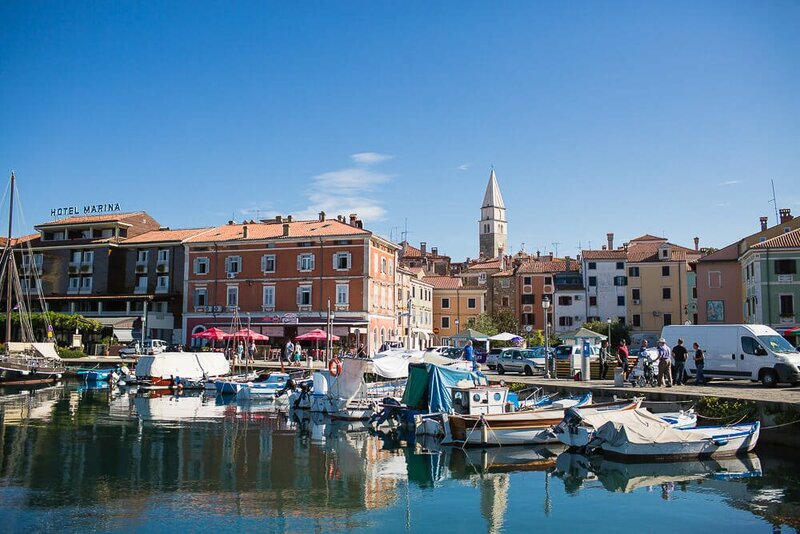 Nevertheless, Izola is also home to the three times Olympic medalist Vasilij Žbogar in sailing. Last success dates to the silver medal in Rio 2016. Upon his return to the hometown, a welcome ceremony was organized, but it became a huge parade, as almost all local inhabitants gathered on the streets cherishing his success. The President of Slovenia was also present. To discover the beauties of Izola from cultural to the architectural we can provide you a free Walking tour of Izola. Contact us for more details.